Although still viewed by many theologians and traditionalists as a newcomer to the world’s faiths, Iomedae the Inheritor seems poised for greatness among the divine. Certainly her numerous orders of paladins have risen swiftly to take on the vaunted role of paragon in many societies. Evangelical in their exuberance to spread word of her wisdom, Iomedae’s missionaries were pivotal in the defense during the fabled Siege of Solku. They sacrificed their lives saving the town from gnoll slavers, and although none of them survived the siege, their presence lived on. Particularly in the eyes of young Seelah. Seelah’s family came to the walled town of Solku as pilgrims fleeing the atrocities of distant Geb to the distant south. Unfortunately, they traded one peril for another, and within months of their settling in Solku, the gnolls of White Canyon began their infamous pillaging. Seelah’s parents were slain in the first of these raids, leaving her orphaned at the age of 14 in a strange town. She did what she must to survive on the city streets, pickpocketing and bullying and even hiring herself out as a mercenary. When a group of Iomedae’s knights arrived to defend Solku, Seelah was immediately taken with their beautiful, shining armor, and within an hour she had stolen a particularly fine mithral helm with a golden bird upon its brow. Yet then, something strange happened—Seelah became overwhelmed with guilt at her theft. For days, she agonized over the act, trying (and failing) several times to pawn the helm. During the Battle of Red Hail, Seelah realized that one of the bravest knights, a woman named Acemi with hair in long braids, fought the battle without her helm. This was the woman’s undoing—in holding Solku’s gates, she took a mortal wound to the skull from a gnoll’s flail. The woman’s heroism carried the day, but that evening she died of her wound. Wracked with guilt, Seelah approached Acemi’s body as her companions prepared for her pyre. They watched silently as Seelah placed the stolen helm over the dead woman’s head, and then climbed onto the pyre aside her to join her in death. The paladins were moved beyond words—they had known from the start that Seelah had stolen the helm, but Acemi had forbidden her brothers and sisters from collecting it, hoping that the helm would bring the desperate orphan enough money to survive for another few months. The knights of Iomedae took Seelah in that night. Although she has come to terms with Acemi’s death, Seelah still regrets the theft that ironically brought her into Iomedae’s arms. She originally came to Iomedae out of guilt, but in the past several years, that guilt has transformed into a powerful love and faith in the Inheritor. 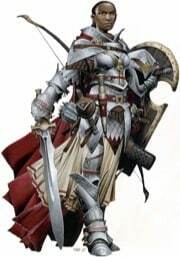 The young paladin wears her hair in Acemi’s style and is trained in the use of the longsword. In so doing, she hopes to carry on the good work that Acemi might have done had she not fallen at the Battle of Red Hail. It’s the least she feels she can do to make up for a death that she allowed to happen.